When we go camping, FOOD is of the highest priority. 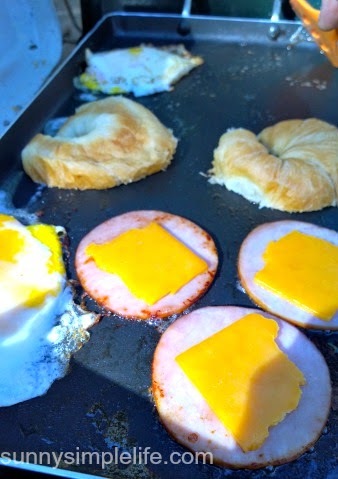 We always have what we think is the best breakfast sandwich ever, a Canadian bacon, cheddar, egg, croissant sandwich. But of course it can be made and enjoyed at home so I am sharing with you so you can liven up your morning and make your tummy happy too. 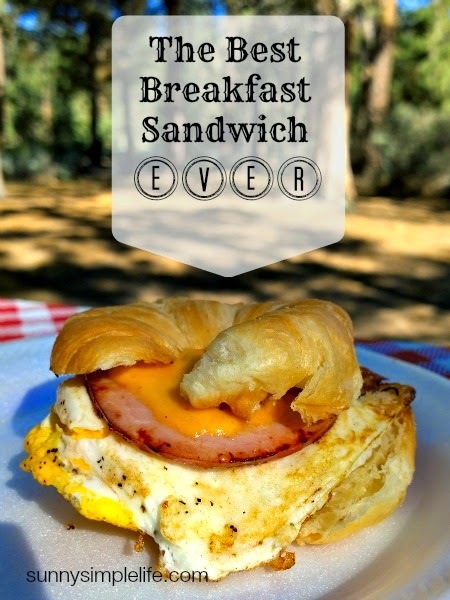 I love breakfast sandwiches because you can combine anything breakfast appropriate and slap between some bread and have an easy to handle on the go sandwich. Butter your pan (a large skillet works perfectly) and fry your eggs hard. Season with salt and pepper. Meanwhile, place your Canadian bacon on the skillet to let it heat and butter your croissant and place butter side down on the skillet to toast and brown up. When eggs are about done, place a slice of cheddar on to start to melt. Pull your croissant and then assemble your sandwich with egg/cheddar and ham. Enjoy!! That looks really good. I'm going to have to remember that. I'm starving right now and I sure I just drooled on my keyboard, YUM! or when my kids were sick, I called it a farlap surprise, it was a fried egg with melted cheese on it on toast, it was always liked. I could have this for breakfast, lunch, and dinner! Having company tomorrow - guess they will be eating the best breakfast sandwich ever.